We are always blessed when we spend time with the Lord in Eucharistic adoration. This booklet gives us an even greater appreciation of this beautiful gift. It encourages us to fix our eyes on Jesus and listen to his voice in adoration. As we do so, the Holy Spirit can use this time to show us how we can overcome sin and temptation and reach out to those in need. 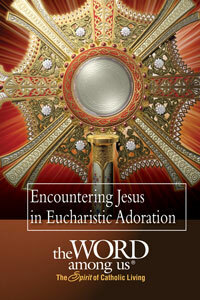 Encountering Jesus in Eucharistic Adoration examines the "divine logic" behind Eucharistic adoration and some of the miracles that strengthen our faith in Jesus' real presence in the Eucharist. It also reminds us that Jesus, too, is blessed by our presence. We bring joy to his heart simply by coming to sit at his feet and gazing upon him in love.